Dozens of Jewish settlers, accompanied by Israeli security, forced their way into Jerusalem’s flashpoint Al-Aqsa Mosque on Sunday, according to local sources. 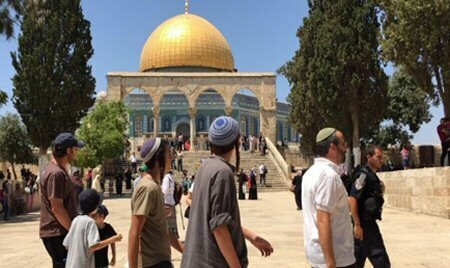 WAFA correspondence said that more than 40 extremist Israeli settlers broke into the holy mosque in groups, under heavy protection from Israeli police. The settlers performed Talmudic rituals and prayers at the holy site.